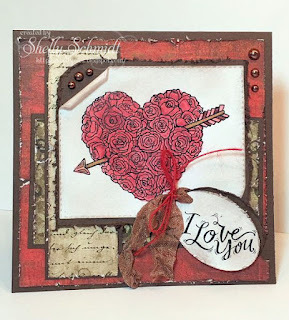 My creative rumblings: Tuesday Throwdown- "Distressed"
This is utterly beautiful Shelly! Beautiful card, Shelly! Such a great color combination and you really nailed the challenge. When I went to look at the other DT cards though I really didn't see distressing on them. If they just used distress ink how could you decide whether the person followed the challenge or not? Your card was the only one I thought followed the challenge. And I truly love it! Shelly, this is gorgeous. Love that image and the ribbon. This is gorgeous! I love the distressed look and image is beautiful. Fabulous distressing and layers on this stunning Valentine, Shelly!! Gorgeous work!